The Simm launched in 1995 as the USS Pegasus in the now defunct Seventh Fleet. Mark Casey then moved the simm to Tango Fleet when he started it in 1996. I joined the simm a few months later, and then took over as CO in 1997. It’s ran continuously under my command since then. Could you briefly explain how Starbase 400 is played? Starbase 400 is played via NOVA, and players use a novel style writing. Basically, a member logs into the NOVA section of the Starbase 400 site and from there they can respond/add to an ongoing joint post with other players, or start their own post or personal log. They can then either save the post to be edited more later (like during a joint post) or send it out to everyone. Also on the NOVA site, a player can update their character info, read though the other players’ info, send PMs to another player or the whole group, nominate their fellow players for awards like ‘Most Improved Simmer of the Month’ or ‘The Bronze Star’ to name two. As an Admin, I can also use NOVA to send out game or site announcements. How much control over the story do your players have? Nearly total. Each Mission (Episode or Story) starts out with post by either myself or the simm’s XO that outlines the basic plot and starts the ball rolling if you will. From there, the players and I add to the story with our posts to move things along. The only things we do shy away from are destroying the Station or it’s support ships (unless pre-arranged) or killing other players primary or NP characters. How do you go about recruiting new members? Is your recruitment process merged with 9th fleet, or separate? Recruiting has really changed since 1997. Today we do what most simms do, we post to a handful of remaining recruitment sites, including SimEnc’s recruitment board. We also post up on the Ninth Fleet’s Forums, and our players also invite people they know from time to time. Statbase 400 is also lucky to have several former players that return from time to time (most are military personnel and return to the game during their few months they are either not at sea, or following deployments before heading out for training and re-deployments again). Out recruiting is our own, but I also send out ads for The Ninth Fleet too, and direct potential players the Fleet’s forums where they can apply for any simm in the group, including SB400. Our application form does require the applicant to not only fill out the form fully, but also required a sample post be written. This gives us an idea of how experienced or not the player is. From there, we ask them to read though both the onsite Academy as well as the site’s Database. From there, it’s ‘On the Job Training’. We have a great core group, many have been simming over ten years each, and we’re more than happy help teach anyone willing to learn. 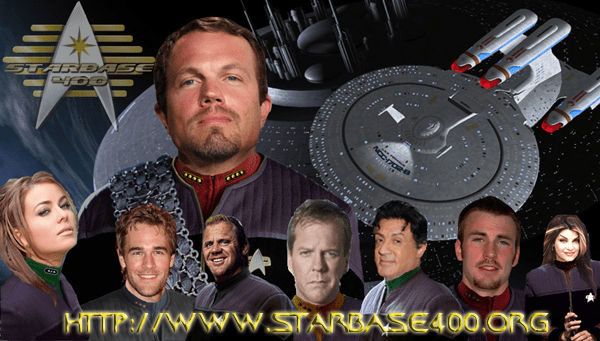 Starbase 400 is part of 9th fleet, do you ever have crossover storylines with other ships in the fleet? Not in the usual sense. The Ninth Fleet doesn’t operate as a typical ‘fleet’. Each simm is independent simms that came together because of mutual respect and cooperation. This also allows each simm to ‘find their own path’, without a ‘Fleet Leadership’ telling them what they can or can not do. That side, two simms did join/merge with Starbase 400, the USS Essex and USS Avenger. Both crews integrated with ours and those ships are two of the Stations support craft now. We also sometimes make mention of other plots ongoing in other Ninth Fleet simms (as long as it doesn’t directly interfere with our plot) to give a little sense of family. Do characters ever swap between ships in 9th fleet? Yes, some character do. It’s not easy in some cases because of the independent nature of The Ninth Fleet, but it can and has happened. What is the advantage for an individual game like yours in being part of a larger fleet like 9th fleet? Mutual cooperation or course, having a community forum for everyone to chat is nice too. Also advertising, anytime someone posts an ad for The Ninth Fleet, it could potentially bring in a new players for SB400. There are many other fleets of Star Trek games on the web. Like the FSF, Borderlands, Star Trek Freedom etc do you ever get involved with those games? The Ninth Fleet is still pretty new, in and of itself, so far we haven’t done any cross-fleet stories. However, when Starbase 400 was still the USS Pegasus and I was the CO of Bravo Fleet, we did a few cross-fleet stories with Tango Fleet and a few others, sharing info etc. Even today, Starbase 400 is willing to allow other groups to use specs, techs, species, etc…as long as they give proper credit of course. How important is the role of your website to your game? Extremely! While we are a Star Trek game, it’s been a lot of time since Nemesis came out. We’ve also been simming a long time, so SB400 has a long proud history of her own. We take the canon Trek we all know, then mix it with a little simi-canon (Novels, etc), as well as the simm’s own history to make a unique simming experience for everyone. Because of that, we have some unique tech, ship classes, and species that you won’t see in any other simm, and because of that the site is important. We also have many things on out site to round out the simming experience like a News Section, the a fore mentioned Academy and Database sections, a Historical Timeline, ships specs and images, the Mission Logs, and much more! How important is the 9th fleet wiki to your game? Yes, we do use the wiki on The Ninth Fleet’s site, but it’s more of ‘our little corner’ in The Ninth Fleet’s world. We make sure the info there is up to date, but our site is our primary means of information. We see the wiki as another link in the recruitment and advertising chain more than an info site in itself. You can read some of our other interviews here, and if you’re interested in being interviewed about your game, get in touch!